This is one of several products marketed as the “world’s strongest coffee.” When brewed as directed, it claims to contain twice the caffeine of regular coffee. The exact blend is a trade secret, but Death Wish uses Robusta beans for their high caffeine content and Arabica for superior flavour. These beans contain 200% more coffee than the standard arabica bean based coffee. The skull-and-crossbones motif makes Death Wish looks more like a gag gift than a “serious” coffee, but there’s more to it than meets the eye. A 64 fl.oz. pot of Death Wish Coffee made according to their guidelines would contain about 3,472 mg of caffeine! All beans used in Death Wish coffee are fair trade, all-natural and organic. This means that there is no child or forced labour used in production; the farmers get a good price for their beans; and neither you nor the farmers are exposed to harmful chemicals with this coffee. Most people describe the flavor of Death Wish as strong, smooth, and bold without being bitter. Taste is of course a very personal preference, but this is a popular blend with coffee drinkers. It helps that Death Wish, unlike some of its competitors such as Banned, gives you the choice of buying whole beans or ground coffee. If you can customize the grind, you’ll be able to get the best flavor out of your brewing method. This product’s main claim to fame is its caffeine kick: they even offer a money-back guarantee if it’s not the strongest coffee you’ve tasted. Many people find it noticeably stronger than regular coffee, while others don’t notice much of a difference. What’s going on? The amount of caffeine naturally found in coffee beans varies a lot even under the most controlled conditions. Trees aren’t all that good at standardizing the percentage of active ingredients in their products. If you order the same coffee from the same café on two different days, the caffeine content can differ by as much as 100 percent. No wonder your morning coffee seems to wake you up better on some days than others! Because most coffee drinkers are already used to varying caffeine doses, many of them won’t notice an extra buzz with Death Wish, even if it is twice as strong on average as regular coffee. 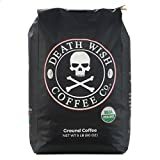 With its skull-and-crossbones logo, a bag of Death Wish makes a perfect novelty gift for the caffeine junkie in your circle of friends. And it’s certainly not all hype: the company puts a lot of effort into maximizing the natural caffeine content of their product. If you end up not enjoying the coffee, at least the packaging is a fun addition to your kitchen décor. Marketing hype aside, Death Wish coffee deserves top marks for its ethical sourcing, its hefty dose of caffeine, and its much-praised bold flavour. It’s well worth giving this one a try and make your coffee directory a bit bigger.